Despite the popularity of mobile devices, there is still very much a place in the home for a dedicated room that’s optimized for the best viewing experience. Watching movies, TV shows, and other streaming media on a tiny smartphone or tablet screen has its limitations. It simply can’t compare to the communal experience of enjoying your entertainment with a group of friends or family on a large TV screen, with a good surround sound system to enhance your sense of immersion. One of the best ways to create the perfect viewing space at home is to upgrade a room with a home entertainment centre. Why a home entertainment centre instead of a home theatre? Having a standalone home theatre room that’s outfitted with a high-end projector, huge professional projection screen, state-of-the-art sound system, and ultra-comfy chairs sounds great in theory. While a home theatre may be the next-best-thing to an actual trip to the movie theatre, for most homeowners they’re simply not practical. They may not have the space for a home theatre or the budget to set one up properly. For many homeowners, however, having a home theatre will be just a little too niche for their taste. There’s also the fact that the addition of a home theatre provides a poor return on investment. That’s why a home entertainment centre (also known as an “entertainment unit”) makes so much sense. The number of gadgets and devices we to use to consume all of our media these days can be downright head-spinning. Trying to keep so many devices and their many cables organized isn’t easy. That’s one of the things that makes a customized media storage unit like a home entertainment centre so special. Every device and the storage space they need will be taken into account in order to create a clean, organized home entertainment hub. A custom home entertainment centre also effectively manages all the cables that are part of your setup so they’re tidy and hidden, instead of an unsightly, tangled mess. On top of all those audio and video components, there’s also all the accessories that comes with them that need to be kept organized. Remotes, gaming controllers, and other accessories used in your viewing room can cause clutter and get lost easily without some manner of organization. TV remotes, in fact, are the most commonly misplaced item in homes. And while streaming’s popularity has shrunk the physical media collections in many homes, some homeowners still have Blu-rays, DVDs, vinyl records, and CDs they might not wish to part with just yet. A home entertainment centre is a practical, all-in-one piece of furniture that creates media and accessory storage space that surrounds the devices you watch or listen to everything on. Remotes and accessories like spare cables can be kept organized in spacious drawers. Your stored media can be kept hidden behind cabinet doors to maintain a clean room aesthetic. Or, if you prefer to show off your impressive Blu-ray movie collection, you could store them on open shelves. 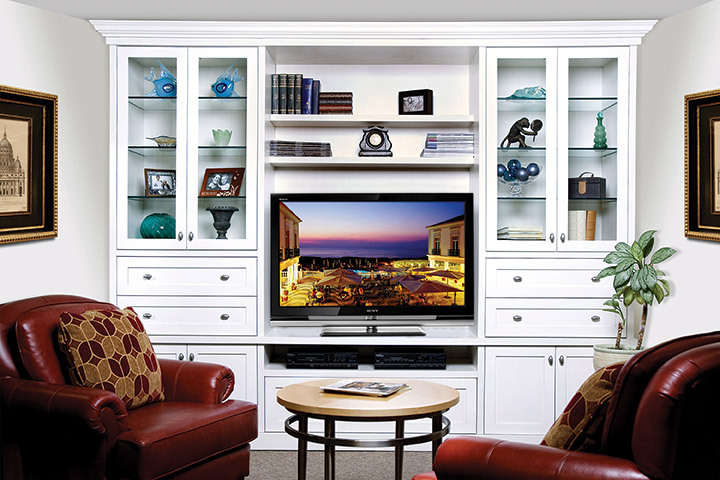 A custom home entertainment centre isn’t just built to fit the storage needs for all of your electronics and media. You can also have it designed to effectively complement and blend seamlessly with your home décor by choosing finishes and the perfect style of decorative hardware. A wide range of cabinet door styles are available, from metal grill to glass to solid panel. Refined touches like LED lighting can further enhance the look of a home entertainment centre. And to really add to the ambiance of your viewing room, an electric fireplace can even be incorporated into the entertainment unit’s design. 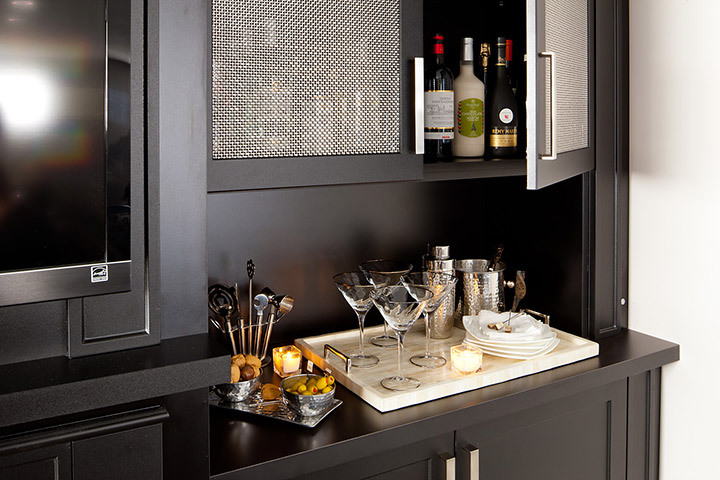 A mini bar could also be added to truly make your viewing room the perfect inviting space for hosting get-togethers. Add extra functionality to a home entertainment centre with a bar. Choosing the right type of home entertainment centre is important because it will be the centrepiece of your living room or whichever room it’s located in. To enhance your viewing space with a one-of-a-kind custom home entertainment centre, schedule your free in-home design consultation with Organized Interiors. With today’s incredible 4K TV technology and the highly immersive audio experiences delivered by surround sound systems, there’s never been a better time for enjoying movies and TV shows at home. There are so many different types of audio and video components and accessories available nowadays. To accommodate them all and keep everything organized, it’s smart to use some sort of storage system as part of your home entertainment setup. While entertainment units serve a functional purpose, the importance of how they look shouldn’t be underestimated. Most entertainment units will be located in highly visible areas of the home. The living room, great room, and family room are popular locations for them. Depending on the size of your home entertainment setup, an entertainment unit will typically be the focal point of the room it’s located in. That’s why the appearance of entertainment units matter. When you want a higher quality look for your entertainment unit, choosing a custom-built model for your home makes the most sense. Custom entertainment units may cost a little more, but they’re certainly worth it. These seven reasons will show you why custom entertainment units are superior to cheaper models found in big box stores. Shop for entertainment units at a big box store and you’ll likely be disappointed with the lack of designs and finishes available. Mass-produced, off-the-shelf entertainment units are designed to appeal to as many consumers as possible. The problem with that philosophy is that everyone’s taste is very different. This means that more often than not, big box store furniture purchases are accompanied by some degree of regret, disappointment, or the feeling you had to settle. With an entertainment unit, you might have had to compromise on one or more of its elements, such as the furniture’s finish, configuration, or size. The shortcomings of big box store entertainment units are really highlighted when you look at what a custom entertainment unit offers in comparison. Instead of choosing from perhaps three or four different finish colours, custom entertainment units allow you to create literally hundreds of different looks for your cabinetry. 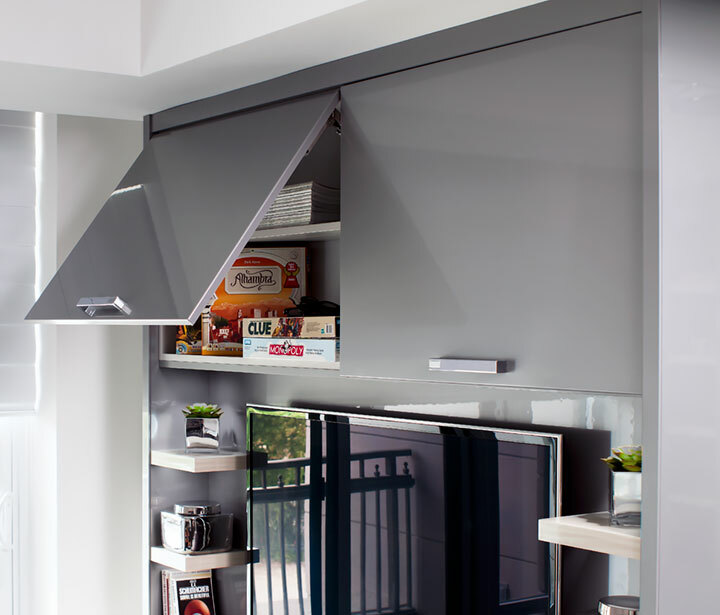 Modern technology allows custom cabinetry finishes to be highly customizable to suit your design tastes. You can choose from a huge selection of melamine and laminate finishes that realistically duplicate the real appearance of wood. If you want a more contemporary look, you’ll love the plethora of solid colour finish finishes available. Simply put, there’s no “close enough” when it comes to how your custom entertainment unit will look. Need more convincing? Visit the Design Studio in Organized Interiors’ showroom to see the hundreds of decorative panel samples available for our custom cabinetry. The one-size-fits-all nature of a retail outlet’s furniture inventory severely limits your choice of entertainment unit sizes. Just as with the unit’s look, everyone has different needs for how big their entertainment unit needs to be. The beauty of custom cabinetry is that it’s built to custom-fit your space and can be manufactured to your exact needs. Whether you need a smaller entertainment unit for the corner of a room or a wall-to-wall, floor-to-ceiling room showpiece, going the custom route gives you much more freedom. A custom entertainment unit can be built to perfectly accommodate each piece of electronic equipment and anything else being stored. Space won’t be wasted, for example, by having your TV sitting in an enclosure that’s too big. We manufacture all of our custom cabinetry on-site at Organized Interiors, which ensures strict quality control. And you won’t need to endure the headache of transporting the entertainment unit home and wasting hours assembling it. 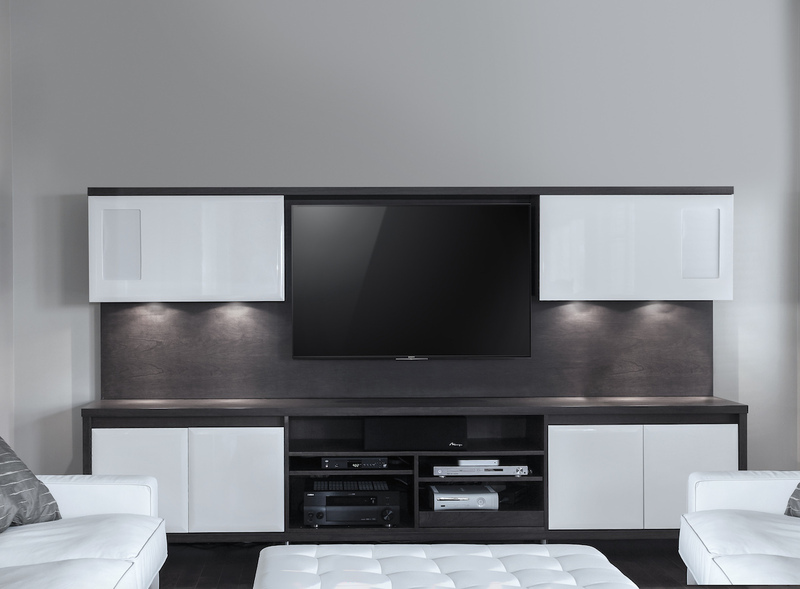 Our professional installers will make sure your new entertainment unit fits perfectly in your home. You’ll be hard-pressed to find an entertainment unit in a big box store that can incorporate a bar or fireplace. Custom entertainment units, on the other hand, allow for the addition of these great extra features. Adding an electric fireplace or electric firebox that sits below your TV within an entertainment unit makes your custom cabinetry look even more dynamic. And electric heating also provides lots of other benefits. Instead of an electric fireplace (or perhaps in addition to it), you could also add a liquor cabinet and bar to your entertainment unit. Along with enhancing the visual appeal of entertainment units, these types of extras save space and also add useful functionality. The ability to customize lets you choose even more extra features that add to the aesthetics of an entertainment unit. For example, you can incorporate strategically placed LED interior lighting, along with various panel, glass, and metal grill door styles. You can also customize the decorative hardware of the entertainment unit. 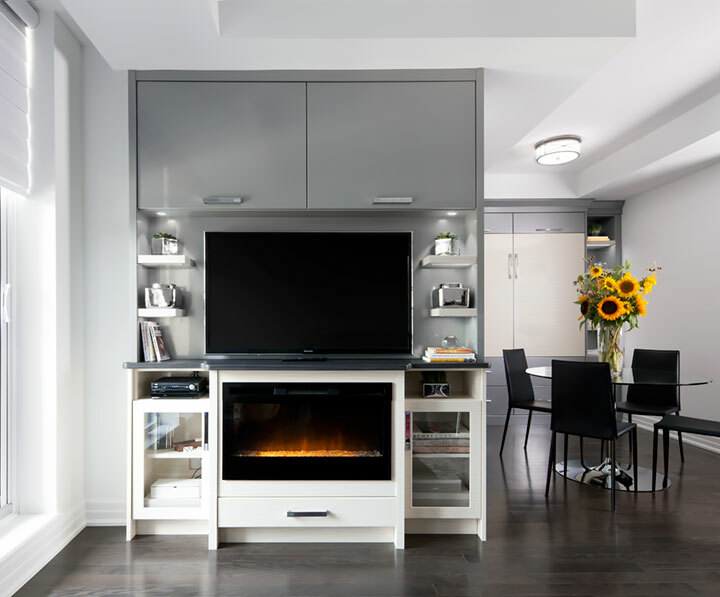 A custom entertainment unit can incorporate a fireplace and LED lighting. Assemble-it-yourself furniture is rather infamous for its inability to provide you with a long life. A combination of poor construction materials and sub-par craftsmanship will result in sagging shelves and peeling finishes long before you’d care for. Investing in a better-looking, more reliable product with custom cabinetry and furniture will serve you better in the long run. The higher quality of wood, superior craftsmanship and durable finishes that custom entertainment units have will translate into a much longer life. Another benefit of higher quality cabinetry is that it can be moved easier if necessary. Flimsy self-assembled furniture tends to not break down and transport very well if you end up moving. Sturdy cabinetry will be more resilient in such circumstances. And although handcrafted solid wood furniture pieces made from oak, cherry hardwood, and other fine wood species look beautiful, even they have some drawbacks. There’s the high cost, of course. They can also crack and warp in locations with moisture levels that aren’t ideal, which can cause the wood to contract and expand. Entertainment units are more than just a glorified TV stand and stereo cabinet. The great care and attention paid to every detail that goes into the design and manufacturing of a custom entertainment unit can result in a truly special upgrade to your home’s décor. Because an entertainment unit tends to be the centrepiece of a room, it needs to complement your existing décor. Matching the colour schemes and styles of your furniture, walls, and other features are critical to maintaining the warm, inviting look of a space that will see a lot of use by the entire family. The design flexibility that custom entertainment units provide makes that significantly easier to accomplish. Conversely, the limited options that big box store furniture pieces have can result in cabinetry that detracts from your home’s décor. Their colours, style, and size may be poorly suited to their surrounding environment. Entertainment units enable you to maintain a well-organized space by creating a proper home for everything, which eliminates clutter. Remotes, gaming accessories, and other peripherals and extra cables cluttering your room can be hidden away in drawers, overhead compartments, and behind doors. Collections of Blu-rays, DVDs, and other media can be stored behind doors or neatly on open shelving. Open shelving also allows you to personalize your entertainment unit by displaying photos, pictures, or other personal effects. Well-designed entertainment units will also hide all of those cables and wires that are connected to our many electronic components. Even the most stylish, expensive entertainment unit loaded with extra features won’t be as impressive-looking if an unkempt bunch of cables and wires is left in plain sight. Keep items hidden and stay organized with overhead storage space in your entertainment unit. 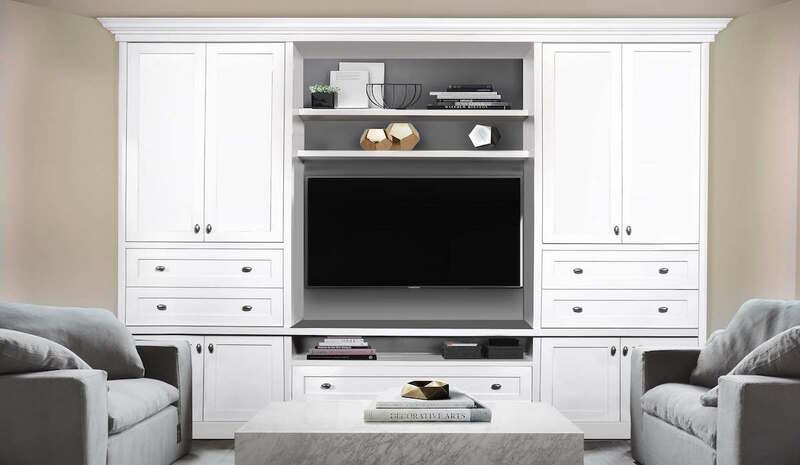 Having cabinetry that’s specifically designed to accommodate everything involved with your time spent watching TV shows and movies simply enhances your overall viewing experience. Having the perfect media centre setup in your living room, family room, or basement will mean you can comfortably enjoy your viewing in a clutter-free space that also looks fantastic. It’ll be a space that lends itself well to showing off to your guests, as well as entertaining them. Are you looking to modernize and upgrade the storage system for your TV and other electronic components? If so, custom entertainment units are the smart choice for your home. Schedule a free in-home consultation so one of our design consultants can discuss your entertainment unit design goals with you. The holiday season brings festive joy and the opportunity to entertain houseguests. While this time of year is enjoyable, it can also be stressful and hectic if your home lacks the kind of decorative touches and features that will really leave a positive impression on guests. One of your worries may be over your home’s inadequate accommodations for overnight guests. Perhaps you’re just wishing your home decor had a more appealing sense of style and character. Is dealing with that ever-present excess clutter that needs to disappear before your guests arrive wearing you down? Try using some of these home holiday tips to make your house a more inviting space this festive season (and year-round). One of the home holiday tips worth considering is to create a comfortable guest room using the spare room in your house. The best way to accomplish this is by having a space-saving custom wall bed (also known as a Murphy bed) installed. Wall beds fold up when they’re not needed, which allows them to be used in smaller spaces. You could even incorporate this guest space into your home office. Organized Interiors can custom-fit your wall bed to the exact requirements of your space, either as a standalone unit or as part of a beautiful custom cabinetry unit. As these instructions explain, they’re easy to use and every bit as comfortable as sleeping on a conventional bed. The convenience and comfort of a wall bed in your cozy guest room will ease your mind, knowing your overnight guests are well taken care of with this high quality sleeping surface. 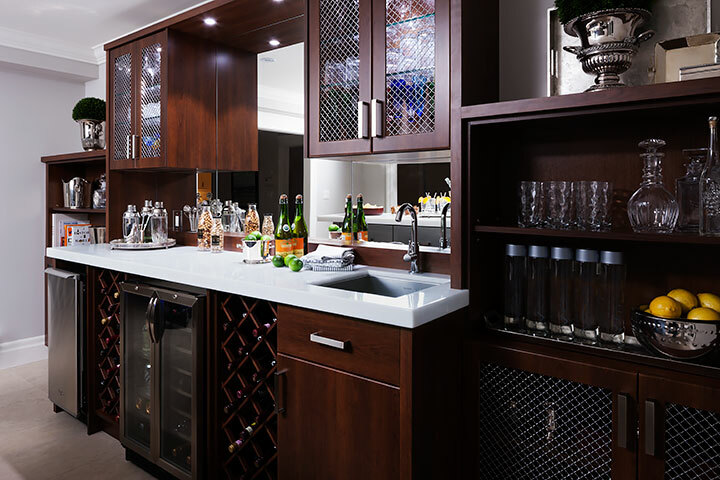 Custom bar cabinetry adds a touch of class to any space. Your holiday houseguests will be impressed by one of the many elegant custom bar cabinetry designs available from Organized Interiors. Our design experts can create a bar as part of a larger custom cabinetry unit, mini-bars for smaller spaces, and island-style bars. Whichever design you choose will enhance the decor and entertaining capabilities of your home. Any good holiday gathering inevitably involves the enjoyment of some quality wines. If you’re a collector who hasn’t yet invested in a high quality wine storage system for your home, consider the benefits of choosing custom wine cabinetry. Regardless of your available space and the size of your wine collection, Organized Interiors has the ideal wine storage solution for you. For larger collections, we can create a beautifully designed walk-in closet wine cellar or a wine cellar room that can also function as a unique spot for entertaining holiday guests. Smaller wine collections are perfect for our reach-in wine closet design. They’re ideal for keeping your bottles stored in the optimal dark lighting conditions, while taking up little space in your home. 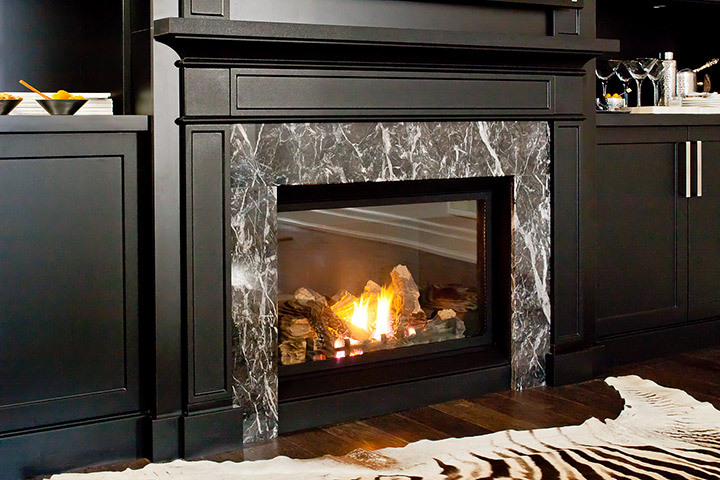 Adding an electric fireplace is one of the home holiday tips that’s guaranteed to boost the ambiance of any room. Any room featuring one is sure to be a popular space for your holiday guests. Modern electric fireplaces give you the charm and appeal of a roaring fire without any of the mess and headaches of wood burning fireplaces. And you’ll still enjoy the pleasant heat that radiates from the fireplace’s energy efficient ceramic heating system. Some of these home holiday tips can be incorporated into the design of a stylish entertainment unit. A customized entertainment unit becomes the focal point of any room where holiday guests are gathered. Your bar and fireplace, along with your audio and video equipment, can all be housed in a custom-fit entertainment unit. There are a wealth of entertainment unit design options to choose from, such as lighting features and wood finishes. Nothing worries a homeowner who’s entertaining guests more than how tidy their home is. Even with the aesthetic improvements that the ideas in these home holiday tips bring to any space, their benefits will be offset by the presence of excess clutter. Stuffing clutter into closets before guests arrive isn’t a practical option. Keep your home clutter manageable with useful organization and storage solutions that make this an easy task. Custom closet organizers and our bedroom storage solutions are your best tools for the job of consistently keeping your home tidy. These six home holiday tips will serve you well during the festive season. More importantly, they’ll add enhanced functionality to your home on a year-round basis. Stop by our huge Vaughan showroom to learn more about these and other home improvement ideas. One of our design experts would be happy to visit your home to discuss your design ideas and aspirations. Just schedule your free in-home consultation. Adding an entertainment unit to your home can do you wonders for improving your viewing experience. They’re highly functional and add an elegant touch to your viewing space. But what’s the ideal TV height to use with them? Television height is an important consideration, especially when having your entertainment unit custom-built. Follow these simple rules when it comes to determining the best height for your TV in your entertainment unit. We’ve all gotten stuck with a seat in the first few rows of a movie theatre at least once. Not the most enjoyable vantage point, is it? Looking up at your viewing display doesn’t make for a comfortable viewing experience, especially when it comes to lengthy viewing sessions. Considering a recent stat shows the average Canadian spends just under 20% of their 168 total hours in the course of a week watching TV, the importance of viewing comfort can’t be overstated. Just about every tech expert agrees that the optimal height for a viewing display is at eye level from your viewing position. Slightly below your eye level works fine, too. Using a tape measure, measure the distance from the floor to your eyes while in a seated position to determine your ideal TV height. Consider the body measurements of the rest of your home’s occupants. Measurements don’t have to be exact – an average ideal height for all of you will suffice. Don’t forget about a variable like reclining seats that will affect your viewing position. Remember that having your TV height a little lower than your eye level is better than having it a little higher. The main goal is to give yourself the best sightline towards your viewing display so you’ll get the highest level of picture quality from it. Bring your ideal TV height measurement to our design experts, who will work with you to create your dream entertainment unit. You can customize your entertainment unit with interior lighting, cabinets, glass doors, and other attractive features, including your choice of beautiful finishes. Book your free in-home consultation today! Canadians watch 30 hours of television per week, according to the most recent report published by the Television Bureau of Canada. 78% of that viewing was done in the family room. These statistics highlight the value of having a quality entertainment unit in your home. An entertainment unit can add a lot of benefits to an activity we spend so much of our leisure time on. And even though handheld devices are popular, the data shows that while at home, the vast majority of people prefer to enjoy their movies or TV shows on a bigger screen in a comfortable setting. Consider these four entertainment unit ideas before buying. Your family room, rec room, bedroom, or home theater room will look even better with a well-designed entertainment unit. Unless it’s in a home theater, an entertainment unit (even a large-sized one) actually shouldn’t be the focus of the room. It should complement your room’s decor, just like any other piece of furniture. A custom-built unit can do more than just house your electronics and store your media. There are multi-purpose aspects that an entertainment unit can bring to your room’s decor. You can outfit the unit with a roaring gas fireplace or a handy liquor cabinet and bar. The type of mass-produced entertainment unit sold in big box stores that requires you to assemble them are inexpensive for a good reason. They’re plagued by poor wood quality that’s prone to sagging and fake glued-on finishes that don’t stay stuck. Surely that’s not a befitting home for the high quality TV and audio/video components you’ve worked hard to purchase. Avoid this type of cheaply constructed entertainment unit. Experience tells you that it simply won’t last. 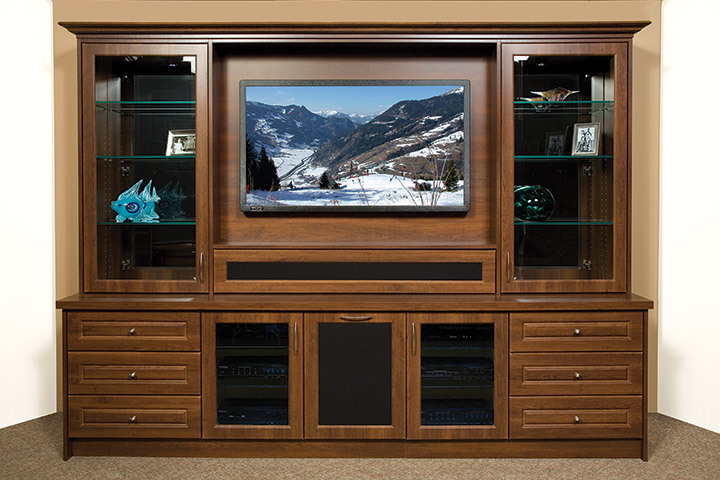 A well-crafted, custom-built unit will assuredly outlast the lifespan of your TV and audio/video components. They also look much nicer, adding beauty to your room even when the television isn’t being used. Durability and looks aren’t the only benefit of buying a custom-built entertainment unit. Going the custom-built route opens up the ability for more colour options and other design choices, so you can create the exact type of entertainment unit you want. This design flexibility will also allow for a more harmonious union with your room’s decor. You’ll appreciate the functionality an entertainment unit brings to your room. Keep your DVDs, Blu-rays, and video games organized and easy to find, either behind closed doors or displayed for all to see and get a sense of your pop culture tastes. We all use so many types of technological components nowadays. Keeping any combination of your flat screen TV, receiver, DVD player, Blu-ray player, streaming device, PVR, cable receiver, and gaming console organized can be a challenge. An entertainment unit can accommodate all of them in an organized fashion. The unit’s design also conceals all those unsightly cables and cords and provides the necessary ventilation for your electronics, ensuring them a longer life. Why not upgrade the TV viewing room you spend so much of your free time in? We’re pleased to offer you a free in-home consultation to help you design the kind of entertainment unit that will make your family’s viewing experience more comfortable.